At SIHH 2017,Swiss Montblanc is introducing a revamped TimeWalker collection, the sportier of the brand. The new aesthetic code is all declared in the new Montblanc TimeWalker Chronograph UTC Watch which combines chronograph and dual time functions, making it the ideal companion for frequent travellers. The new model features a Montblanc TimeWalker Watch With 43 mm DLC-coated steel case with semi-skeletonized horns and a mix of high-tech materials, such as black DLC, high-tech black ceramic and black rubber. The uni-directional rotating bezel crafted from black ceramic is knurled on the flank for a better grip and includes a silvery-white engraved 24-hour scale for greater legibility and functionality. The black DLC crown and pushers have also been finished with a knurled decoration that takes its inspiration from the design of the petrol caps popular in classic racing cars. 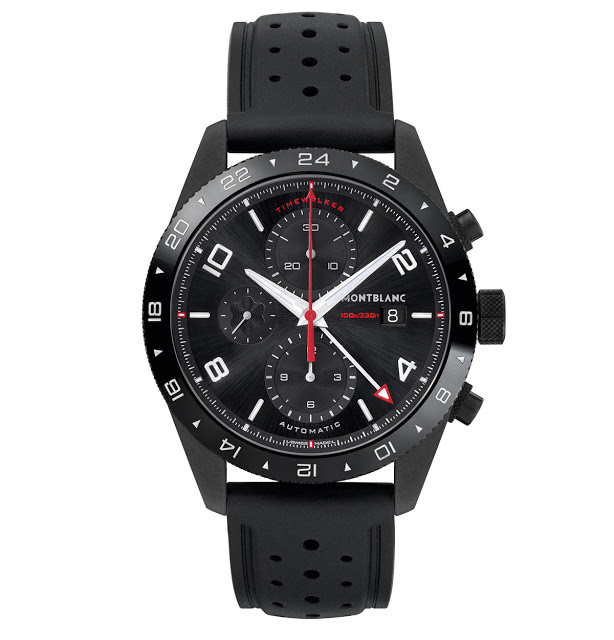 Black is also the dial, which is laid out like an old car dashboard with two vertically aligned subsidiary dials for the chronograph, one a 30-minute register and the other a 12-hour register. The chronograph seconds hand is bright red with a Minerva-inspired arrowhead tip. Powered by Calibre MB 25.03 (ETA 7754 based), the new TimeWalker Chronograph UTC shows the time in three different time zones. Local time is indicated with the rhodium-plated hands, and the home time can be read via a dark central hand enhanced with a red arrow and SuperLuminova at its tip. The readings are accompanied by the 24-hour scale on the bezel.